A Little Hut - Patricia Zapata: go vote! I just got back from doing that myself. Feels good to have that taken care of. Now I can just sit back and wait for the results. Another good thing... I don't like making the trek all the way to the Dr's office but at least I got good news—a clean bill of health. The view wasn't too bad either. 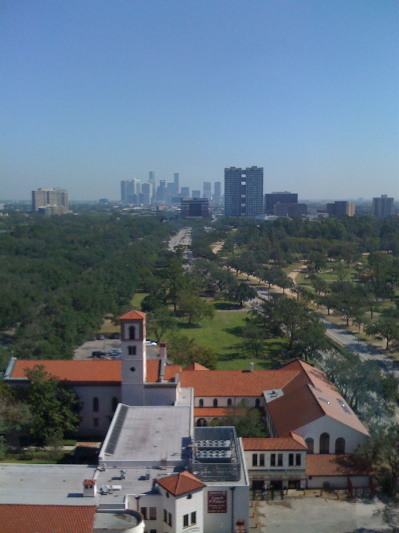 This is what I saw yesterday from his building —view from Medical Center towards downtown Houston. (Taken with my trusty iPhone). Today I'm on a mission to get a lot accomplished so I'm out of here! That's a great photo - I love the Spanish-mission-looking building. I love your blog - thanks for all the information and ideaS!